This item can not be ordered at this time. Price further reduced from original sale price $19.95 to $10.00 because these come without a carry case. Carry case is not included. This orange emergency and disaster cooking stove uses readily available butane canisters so you can boil water for safe drinking or heat up a meal. 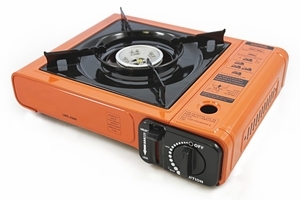 This portable stove should be included with your emergency supplies. Heat up a can of soup or boil water for safety. It is lightweight yet powerful and comes with owner manual and safety instructions. The stove uses 220g Butane fuel canister which are readily available for purchase at local sporting goods stores. Butane canisters are available for WILL CALL orders at $5.00 per 4-pack (plus sales tax). Sorry, we can not offer the gas canisters for online sale and shipping via UPS etc. since federal safety regulations and the FAA classify them as highly flammable goods which carry shipping restrictions through small package transportation carriers such as UPS, FedEx or Postal Service. However, the butane canisters are readily available at local outdoor sporting goods stores and even many grocery and convenience stores.